Homemade Mango Frooti / Mango Fruity – Yes you read it right..!! Just do yourself a favour by making homemade Mango Frooti before you grab a bottle of Frooti / Maaza / Slice from the market. 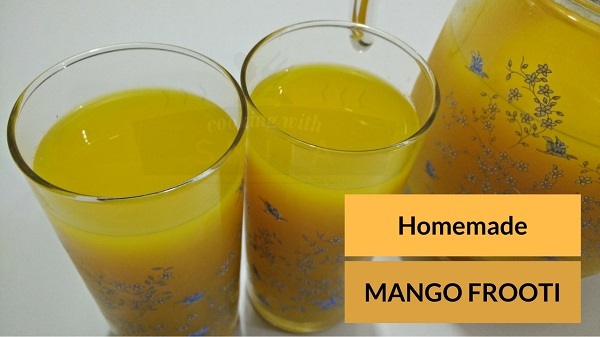 It is healthy drink as it’s made from Mango Fruit with no preservatives added. Follow this step-by-step guide on how to make Mango Frooti at home. Add Raw Mango and Ripen Mango in a mixer Jar. Add ½ cup water and grind until smooth, make sure there are no pieces left. Heat water in a pan over medium flame. Add sugar when water is slightly warm, constantly stir until Sugar is completely dissolved. Now add Mango paste and stir well. Boil for 10 minutes over medium flame and stir at regular intervals. Taste the Frooti mixture at this stage; you can add more sugar if required. After 10 minutes, switch off the gas and let it cool down to room temperature. After cooling, the mixture will become thick. Strain the Mango Frooti using a strainer. As Mango has a lot of fibres, so it’s necessary to strain it while making Frooti. Keep in refrigerator for 4 – 6 hours. After cooling, Mango Frooti is ready to serve. Store in refrigerator and consume within 15 days.